Names in this online transcription include Adams, Amerman, Axtell, Barker, Beck, Bell, Bird, Blair, Blazure, Bockoven, Bonnell, Bowers, Bunn, Card, Cole, Collyer, Compton, Croot, Cummings, Darling, Deforest, Drake, Dunham, Frost, Giddis, Golder, Guerin, Hamler, Hanna, Height, Hodgson, Isaacs, Johnson, Kelly, Lawrence, Masker, McFarland, McMullen, McVicker, Moore, Oliver, Packer, Parker, Price, Quimby, Riell, Rolstin, Rose, Sanders, Savage, Scott, Stone, Stout, Sturgis, Totten, Van Fleet, Van Ness, Waldron, Ward, Watson, Winget, Wolf, Wray. 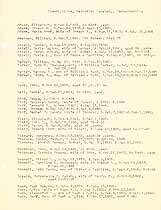 This page features a historical book or original document that was transcribed during 2007 as part of the Genealogy Today Subscription Data collection -- a project focused on capturing details about the lives of your ancestors, from their early years in school, through college and then into their careers, hobbies and group activities. The list of family names above represents unique last names of individuals found in these Bernardsville Methodist Cemetery records. While an annual subscription costs less than ten cents per day, there is nothing wrong with being cautious about spending your research budget. That's why we have made this resource searchable -- you can discover possible matches before you subscribe. In records of this type, researchers may discover information about lot holders, grave maker inscriptions or other burial-related details. Libraries (and genealogical societies) may subscribe to this Subscription Data service and provide their patrons (or members) with unlimited access from shared computers. For details, please visit the On-Premise Access page. The Genealogy Today catalog number for this item is 13910. When inquiring about the information in this resource, please mention the catalog number.